Comments: Nice quiet neighborhood park. Fenced in. 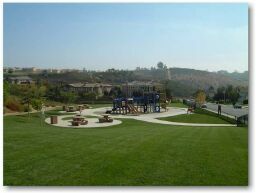 Huge sloped grassy area. Play Equipment: Swings for both toddlers and bigger kids. Play structure with monkey bars, a couple slides, intended for kids over 5, but works for children under two as well (with close supervision).